‘Healthy’ and ‘Filipino dishes’ don’t always go together in the same sentence — but when they do, the results are wonderful! 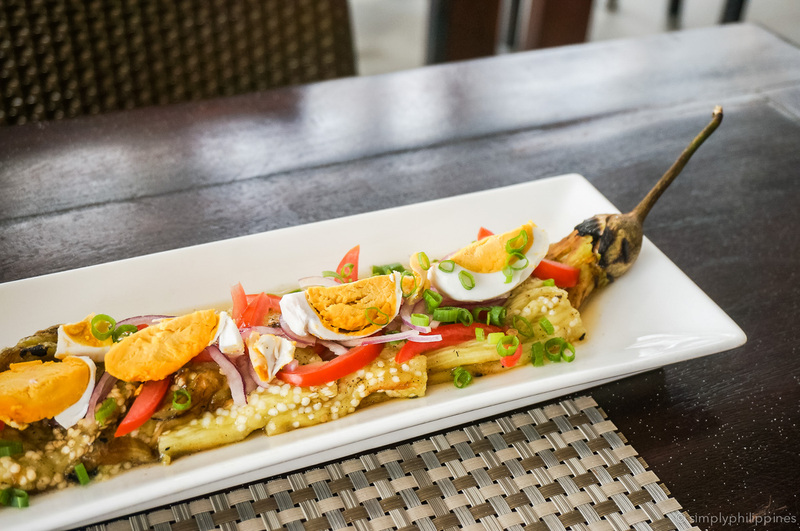 Eating around the islands can be fun, but only if you know what to order. Here are 17 of our favorite light and healthy Filipino dishes to try. Known as the Philippines’ version of ceviche, kinilaw is made with top-grade raw fish cubes, lightly cured in vinegar, chili, ginger and sometimes coconut milk. Chopped onion and tomato are added for texture. A comforting, delicate soup made with ginger, garlic, squash, tinola is a winning dish for a simple dinner. Eggplants are grilled over an open flame, peeled and pan-fried with egg in a smoky and satisfying omelet. Just about any restaurant can make this for you. Chinese influence is written all over this dish. White-meat fish is drizzled with sweet and sour sauce and slivers of crunchy bell pepper and carrots. Thin rice noodles stir-fried with vegetables, seafood and meat, best enjoyed with a squeeze of calamansi. Order this for a light lunch when you need a break from all that rice. Not many people expect to find lentils in the Philippines, but the humble monggo soup is many a Filipino chef’s favorite home-cooked dish. These are a little difficult to find, but if you spot them on the menu, be sure to order! They’re great in hamburgers or on their own with a sweet and spicy dipping sauce. Our favorite banana blossom burger is from Barton Bistro in Port Barton. Tamarind pulp is what gives this delicious soup its sourness. Sinigang can be made with meat, fish or seafood, and usually features a medley vegetables. You can try the Philippines signature adobo flavor with veggies! String beans (sitaw) or morning glory (kang kong) in adobo sauce make a great veggie addition to the table. Warning: These are addictive. Tender, fresh squid are stuffed with a mix of spices, tomato and onion then grilled over charcoal until tender. The local alternative to curry, this dish is best when the cook adds plenty of fresh lemongrass and ginger to the mix. For a vegetarian version, ask for ginataang gulay. With so many islands, you’ll be completely spoiled for seafood in the Philippines. Be sure to try grilled tuna belly, grilled scampi and grilled bangus. Mmm! TIP: In any Filipino city you can order grilled tuna belly at Gerry’s Grill. This light chicken and coconut soup is a speciality in the Visayas region. Look for it when you’re traveling islands like Bohol. 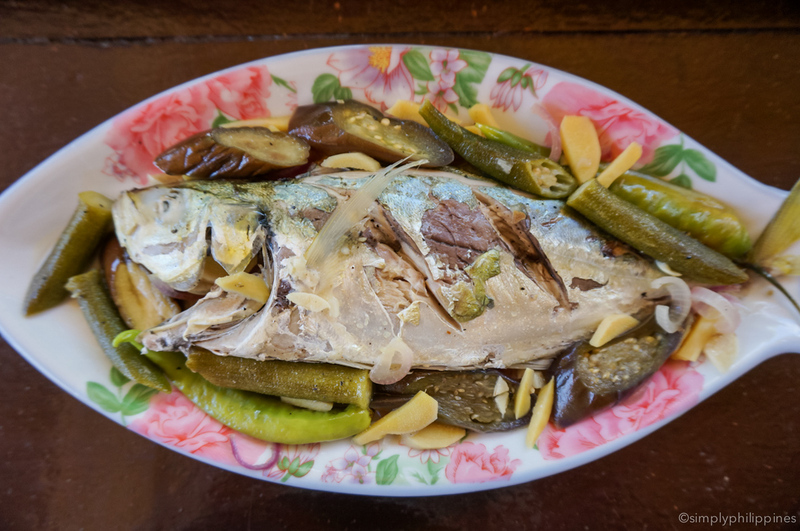 One of the most genuinely Filipino ways of preparing fish, paksiw is a piquant dish with a vinegar base. Pour a few drops of the sauce over steaming hot rice and enjoy. The best paksiw we’ve tasted was at Baha Bar in Siquijor. Directly translated as ‘beans and squash’ this pair of veggies simmered in a little coconut milk is a welcome addition to any table. Smoky eggplants are grilled until tender, then stripped of their peels and topped with freshly chopped onion and tomato and a squeeze of local lime juice, and sometimes a salted egg. Curry is not the first thing you think of when ordering in the Philippines, however yellow curry made with fresh coconut milk is a pretty sure bet when you’re not sure what to order. Our favorite fish curry is from Ursula Beach Club in Palawan. There you have it! Don’t believe everything you hear about Filipino food. Tracking down healthy food IS more of a challenge in this country, but there are so many delicious Filipino dishes to try. Happy eating!